$14 for 2 Reusable Snack Bags & 1 Sandwich Wrap/Placemat + FREE Shipping! $28 Value! Here's another great Mamasource deal! With this one, you can get 2 reusable snack bags and 1 sandwich wrap/placemat for just $14 with free shipping. This is a $28 value! If this is your first Mamasource purchase, use the code DEC10 to save 10%! There are two different designs to choose from, flowers and bugs (pictured above). 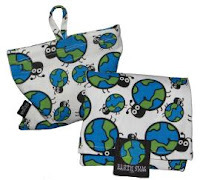 Kick off the New Year with a clean, green concscience with reusable snack bags and sandwich wraps from Earth Swag. 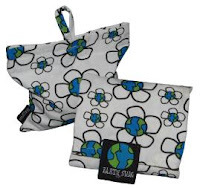 Made from food-safe, bacteria-inhibiting cotton, their snack bags and sandwich wraps are stylish and sustainable. The worry-free fabric is machine-washable, moisture-resistant, and stands up to stains. You’ll receive two snack bags (great for school, day trips, or picnics) and one sandwich wrap that opens into a placemat for an instant, hygienic eating space.